One of the most common parent scales, harmonic minor is a bit elusive when it comes to using it in a jazz guitar context. Though you will use the major and melodic minor scales much more often than harmonic minor, it’s still an essential scale to learn and apply to your solos. In this lesson you will learn how the harmonic minor scale is used, how you can apply it to your jazz guitar solos, and more. When soloing with the harmonic minor scale in jazz, you don’t often use the scale over minor chords, as you might expect. 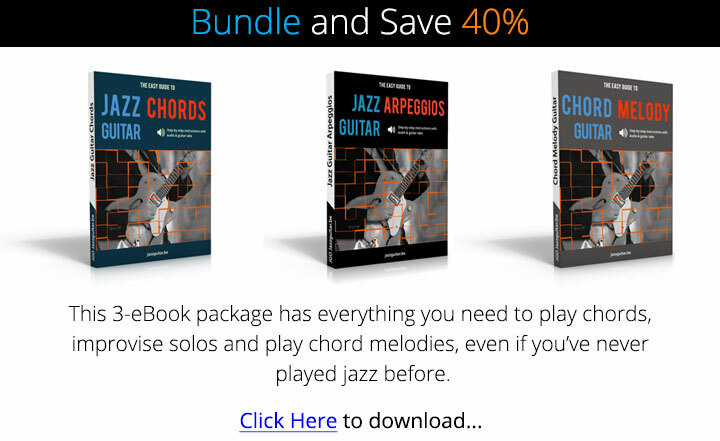 But, you do use it in minor keys, just over the V7 chord in a minor jazz progression. The most obvious example of this would be the V7alt chord in a minor ii V I progression, as you see in the examples below. When you’re in a minor key (Am for example), and you see the V7 chord (E7alt in that key), you play A harmonic minor. As a guideline, when you have a minor ii V I, you play the tonic harmonic minor scale over the V7alt chord. For example, if you have Bm7b5-E7alt-Am7 (a minor ii V I in Am), you play A harmonic minor over the E7alt chord. Another example of where to commonly use this scale is in a jazz blues progression. 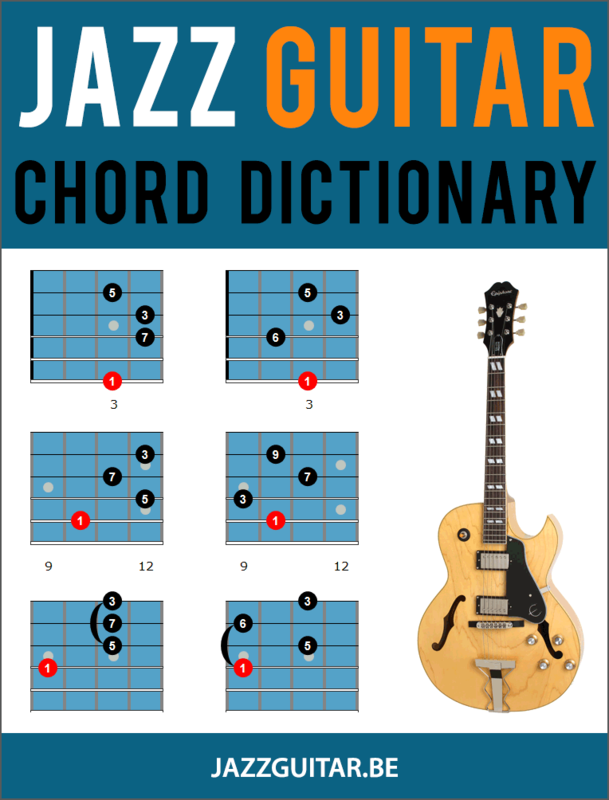 In bar 8 of a jazz blues progression, you have a VI7b9 chord, such as D7b9 in an F jazz blues. There, you use the same guideline: over D7b9 you play G harmonic minor in bar 8 of an F blues. Now that you know how to use harmonic minor in a jazz context, here are some fingerings to get you started with this scale on the guitar. Here are two fingerings for that scale to learn and add to your soloing. Memorize each shape and take both to all 12 keys with your metronome to drill these shapes into your fingers and ears. When you’re comfortable with these shapes, move on to the licks and full solo below. To help you get the sound of this scale into your ear, here are four ii V I lines, 2 short and 2 long, to learn and add to your solos. Start by learning each line as is, then take them to other keys and other positions before adding them to your jazz guitar solos. The first lick uses a skip up to the b9 of E7alt (F), that resolves down to the 5th of Am7 (E), in this ii V I in Am. 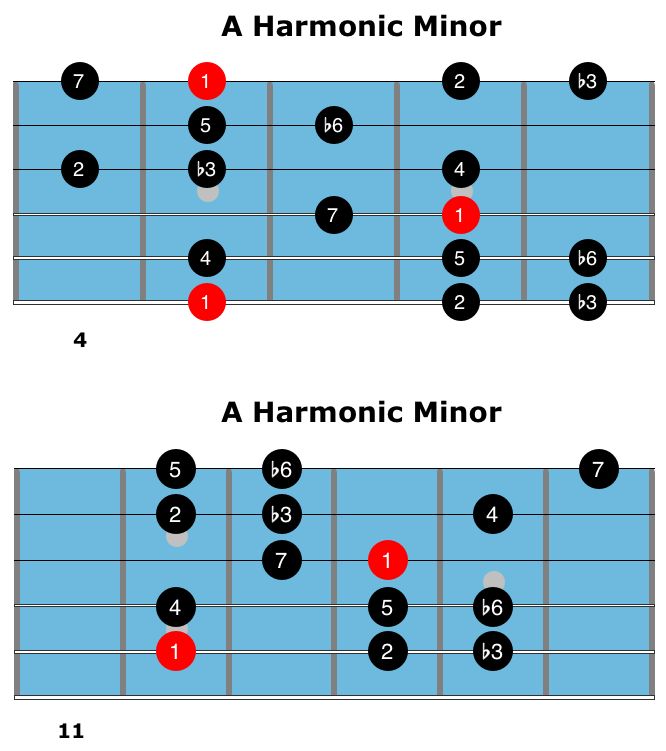 Harmonic minor has a number of half-step resolutions that you can explore, and the b6-5 (F-E in Am) is one many players use to create interest in their solos. As you expand on this scale in your playing, look for those half-steps to play with in your lines as you dig deeper into those sounds in your solos. The next lick uses a pattern that runs down the A harmonic minor scale in the second bar of the line. This pattern can be heard in Pat Martino’s solos, among others, and it’s a solid way to create a memorable flow to your lines with this scale. See if you can continue this pattern down the scale as you expand on it in your playing. This is the first harmonic minor line I ever learned, and it’s one that highlights both the 3rd and b9 of the E7alt chord in the second half of the first bar. As well, since this is a short ii V I, where the ii V are in the same bar, you can use A harmonic minor over both chords in that first bar. You don’t have to use harmonic minor over both the ii and V, but it can be helpful at faster tempos or when the chords move by quickly such as this line. The final line borrows from the McCoy Tyner playbook, among others, as you use the harmonic minor scale over both the ii and V in a short ii V.
The opening five notes, B-C-G#-B-A, are commonly used with this scale, so work that pattern into your playing beyond this lick to expand it in your solos. Now that you know how to use the harmonic minor scale in jazz, how to play it on guitar, and some licks using this scale, you can take it to a tune. Here’s a one-chorus solo over Summertime (in the key of Am), that uses two different harmonic minor scales, A HM and D HM. Learn each phrase one at a time, then bring the solo together as a whole from there. If you like any of these phrases, take them out of the solo and work it in other keys and positions to take it further in your studies. Lastly, learn the solo along with the given audio track before playing it along with the backing track. When you can do that, work on soloing in real time over the track, using the harmonic minor scale over the 7alt chords and short ii V’s in this tune. Why is the 6th note flat? Should it not be F#? The harmonic minor scale has a b6 in it. That’s why it’s an F in Am. Download links are 404 at present. Download Links use an invalid syntax. Look at the error message e.g. “http://www.jazzguitar.be/blog/wp-content/uploads/2017/07/autumn-leaves-solo-1.mp3” does not exist. Copy that link into a new tab and it will play. Then click “Download this page”. That should do. But anyway, the web people should test the function with Firefox before publishing. Excellent. concise lesson. My sincere thanks and congratulations Matt. Happy new year.